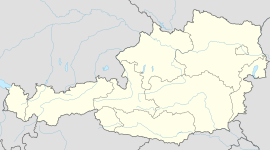 Wörgl (German pronunciation: [ˈvœrɡəl]) is a city in the Austrian state of Tyrol, in the Kufstein district. It is 20 km (12 mi) from the international border with Bavaria, Germany. Wörgl is an important railway junction between the line from Innsbruck to Munich, and the inner-Austrian line to Salzburg. Its railway station has been designated as a Hauptbahnhof (German: main station) since 10 December 2006. European route E641 connects Wörgl with Salzburg, the routes E45 and E60 (Austrian autobahn A12) pass through Wörgl. Nearby Itter Castle was the site of one of the last European and most unusual battles of World War II. The Battle for Itter Castle was fought on May 5, 1945 by surrendered Wehrmacht troops, the United States Army, Austrian Resistance fighters and former French political prisoners against the 17th Waffen-SS Panzer Grenadier Division. The leader of the surrendered Wehrmacht troops, Major Josef "Sepp" Gangl, was killed during the battle and is buried in Wörgl's municipal cemetery. A street in the city is named for Sepp Gangl. Albrechtice nad Orlicí, a small village of just over 1,000 inhabitants in the Czech Republic. Wörgl was the site of the "Miracle of Wörgl" during the Great Depression. It was started on July 31, 1932, with the issuing of "Certified Compensation Bills", a form of local currency commonly known as Stamp Scrip, or Freigeld. This was an application of the monetary theories of the economist Silvio Gesell by the town's then-mayor, Michael Unterguggenberger [de]. Despite attracting great interest at the time, including from French Premier Edouard Daladier and the economist Irving Fisher, the "experiment" was terminated by Austria's central bank Oesterreichische Nationalbank on September 1, 1933. In 2006 milestones were placed, beginning from the railroad station through the downtown, to show this history. Reinhard Furrer, a German scientist and astronaut, was born in Wörgl. Gerhard Berger, a former Formula One driver and former co-owner of Scuderia Toro Rosso, was born in Wörgl. Stefan Horngacher, an Olympic ski jumper, was born in Wörgl. Hans Peter Haselsteiner, a building tycoon and former deputy chair of the Liberal Forum, was born in Wörgl. ^ David Boyle, The Money Changers - Currency Reform from Aristotle to e-cash, Earthscan, 2002, ISBN 1-85383-895-0, p.237. ^ Eric Helleiner, The Making of National Money - Territorial Currencies in Historical Perspective, Cornell University Press, 2003, ISBN 0-8014-4049-1, p.158-9. Wikimedia Commons has media related to Wörgl. Wikivoyage has a travel guide for Wörgl. "Municipal data for Wörgl". Statistik Austria. This page was last edited on 26 March 2019, at 15:28 (UTC).